One of my favorite places to shop and grab food on the go is Whole Foods Market in Jenkintown. They came up with a great idea. 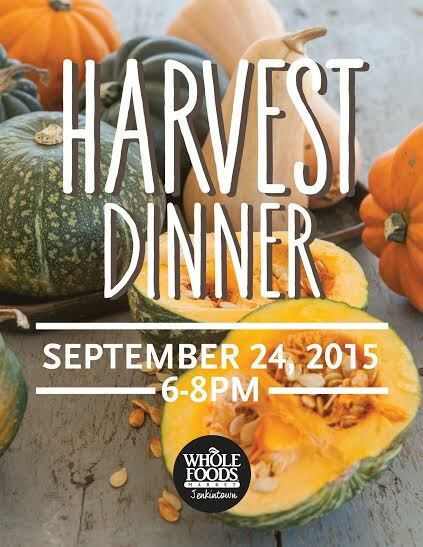 This Thursday September 24th Whole Foods will be hosting a 4 course Harvest dinner. This is the perfect way to begin the fall season. 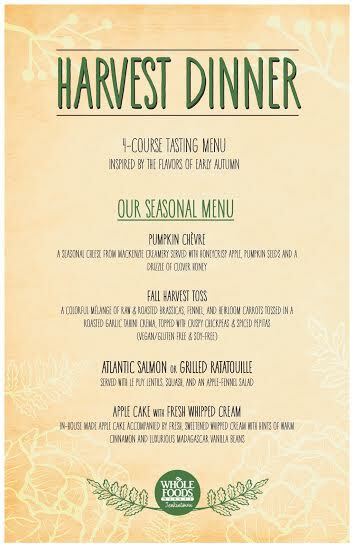 A fresh and delectable tasting menu, curated by our talented chefs and inspired by the flavors of the late summer and early fall. $25 a person will include 4 courses, and 1 raffle ticket towards great prizes. All proceeds benefit the Whole Kids Foundation and their work to get fresh food into schools. I’ll be giving away 2 tickets to tomorrow nights event. Visit me on either Facebook, Instagram or twitter to find out how to win. Good Luck! Wish I had a whole foods where I am. Great event to help kids. Pretty cool.